NEW Easy-to-Cable-Manage Titan Mount | ICWUSA.com Inc.
ICW has redesigned the popular Titan family of mounts so they are even stronger, more rigid, and NOW easy to install and cable manage. 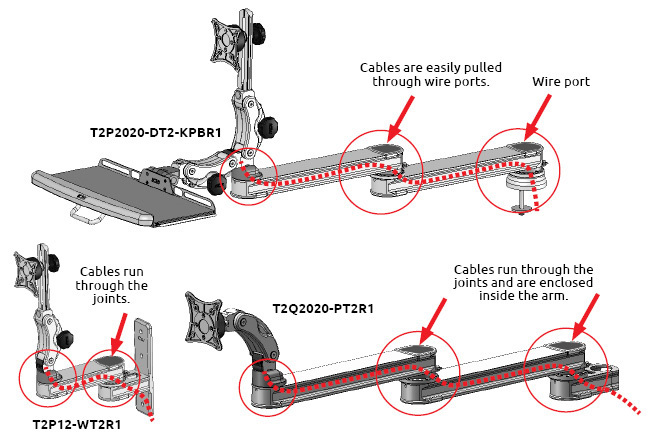 The Titan arm does not need to be disassembled for cable management. Cables are easily pulled through special wire ports. Cables run through the joints and are fully enclosed inside the arm. DESIGN CHANGES ARE FOR ALL TITAN MOUNTS. ICW has upgraded the Titan mount so it is easy to cable manage and does not require disassembly of the arm to run wires. Cable management is fully enclosed. Cables run through joints without disassembling the arm. The Titan 2020 Mount is ICW’s strongest, most rigid computer mount. It is used extensively in manufacturing, industrial and dental settings. The Titan has long reach, stability, and can support a heavy load. Titans mounts are available in desk, wall, wall track and pole mount options.